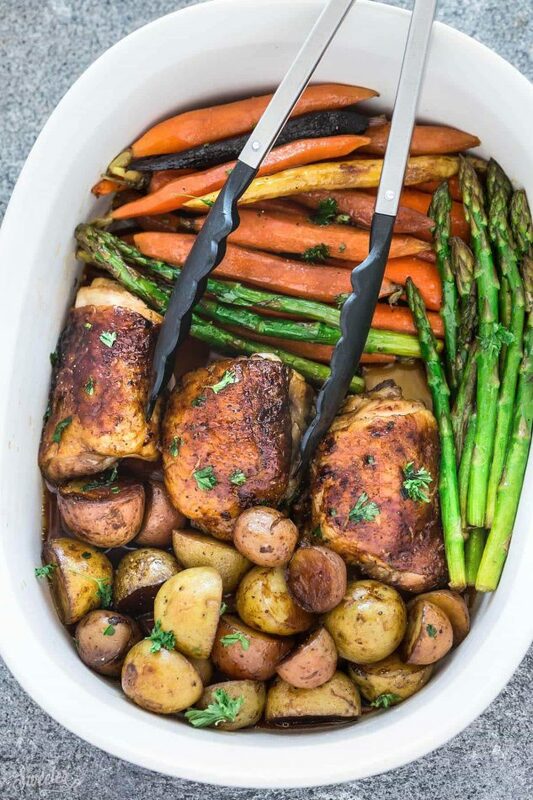 Slow Cooker Chicken and Autumn Vegetables is an easy set and forget all-in-one meal that’s perfect for busy weeknights and an alternative to Thanksgiving for two. Best of all, can be made in the oven or crock-pot with tender and juicy chicken, flavorful herbs and hearty vegetables. During the busy fall months, there’s nothing like having easy set-and-forget slow cooker meals to fall back on. You just toss a bunch of ingredients into the crock-pot. And with a press of a button, you can have a warm meal ready and waiting for your in just a few hours. This Harvest Chicken and Vegetables is a favorite for fall and couldn’t be simpler to make. Start off with some chicken and drop it into a slow cooker along with some hearty vegetables and spices. I love that the veggies cook right along with the chicken, too, so it’s basically an entire meal in one pot. This recipe would also be great if you’re looking for an alternative for Thanksgiving dinner. It’s easy to customize with whatever veggies you have on hand. For this recipe, I use baby potatoes, baby rainbow carrots and asparagus. Broccoli, apples, green beans or even Brussels sprouts would be delicious as well. And for the protein, you can swap out the chicken with turkey, sausage, pork and add in some bacon if you like. 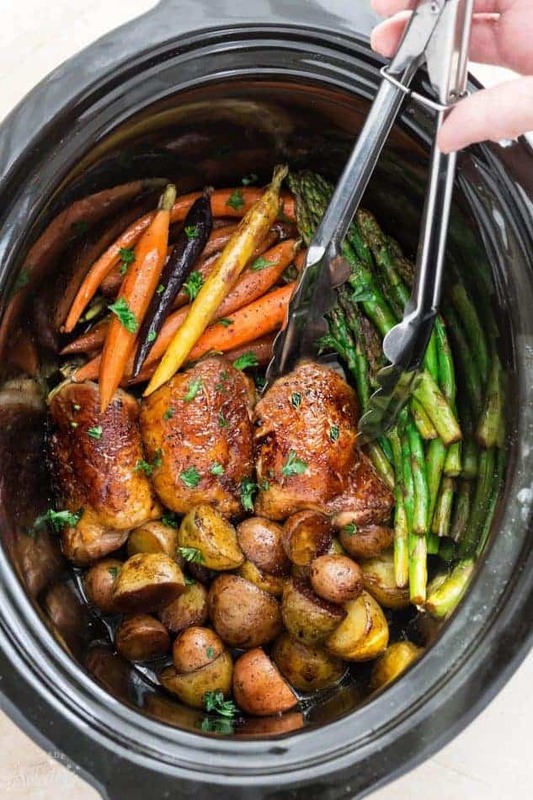 What’s great about this is that you can serve this slow cooker harvest chicken just as it is. Or you can add a quick side of rice or salad and dinner is completely done. 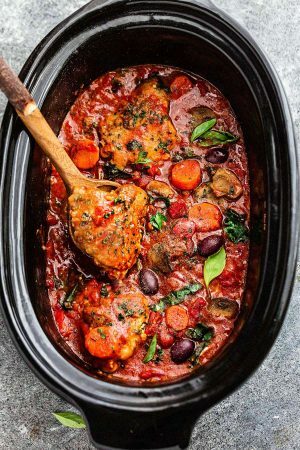 A 6-quart slow cooker definitely works best for this recipe, allowing enough room for all the veggies. If you have one with a timer that would work even better if you have to leave the house. There really is nothing better than coming home to an entire chicken dinner already done. All of that without having to heat up the house. 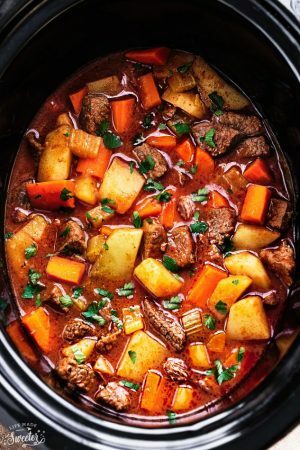 And for those of us that do not have a slow cooker, there’s even instructions so that you can make this in the oven as well. Carefully transfer the chicken to a sheet pan and broil on high for a few minutes if you want the skin to be crispy. Serve the chicken as is, family style, or shredded with two forks. Store or freeze leftover shredded chicken for salads later in the week. 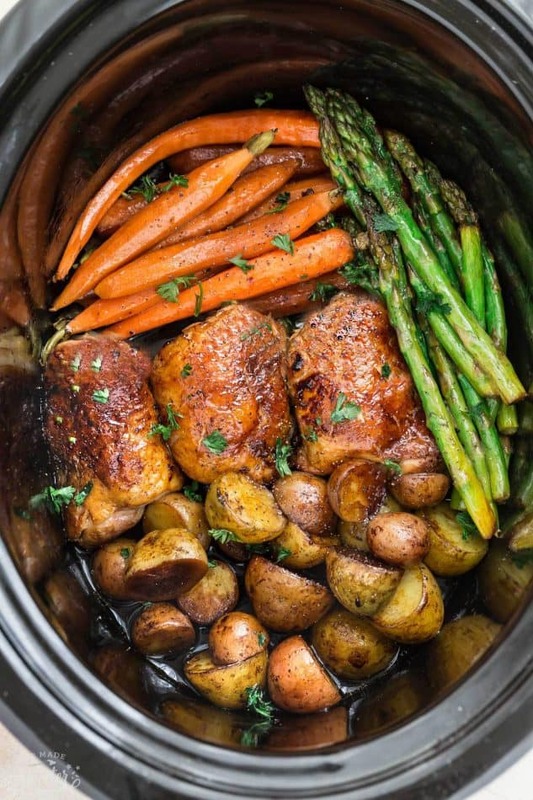 Slow Cooker Harvest Chicken and Autumn Vegetables is an easy set and forget all-in-one meal that's perfect for busy weeknights. Best of all, can be made in the oven or crock-pot with tender and juicy chicken, flavorful herbs and hearty vegetables. In a small bowl, mix together the sage, thyme, rosemary, garlic powder, paprika, salt and black pepper. For the slow cooker methodAdd the potatoes and carrots to the bottom of a 6-quart slow cooker. Drizzle with oil and half of the minced garlic and spice mixture. Toss to coat. Place the chicken on top of the vegetables and rub with remaining half of the garlic and spice mixture. 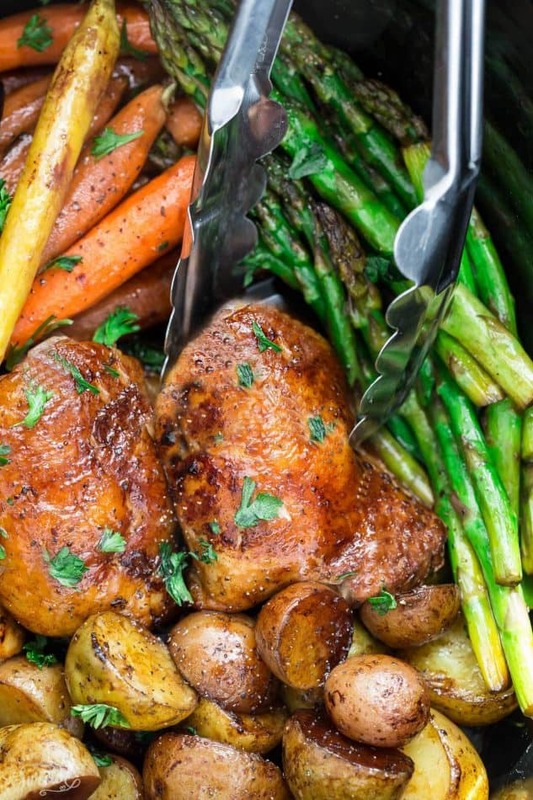 Whisk together balsamic vinegar and honey and drizzle over chicken and vegetables. Cover and cook for 2 1/2 hours on high or 4 1/2 hours on low. Add the asparagus and cook for an additional 20-30 minutes on high, or until asparagus is tender. If you’d like the chicken to have crispy skin, place it on a baking sheet and broil on high for 3-4 minutes. Serve hot with chopped fresh parsley. Preheat oven to 450 degrees. Grease a large 3 quart casserole pan or line a sheet pan with foil or parchment paper. Spread potatoes and carrots evenly on top and drizzle with oil, half of the minced garlic and spice mixture. Toss to coat. Place the chicken on top or around the vegetables and rub with remaining half of the oil, garlic and spice mixture. Roast for 18 minutes, then remove tray from oven. Push aside the potatoes to make room for the asparagus.Lay evenly on pan and drizzle with remaining olive oil and spice mixture and toss to coat. Return pan to oven, and roast until chicken is cooked through, about 15-20 more minutes (until chicken is 165 degrees in center). Turn oven to broil for 2-3 minutes for a more golden skin on chicken if desired. Serve hot with chopped fresh parsley.